You probably don't have 40 iPads lying around your house. But if you have a business or school that does, this cart from Anthro might be for you. 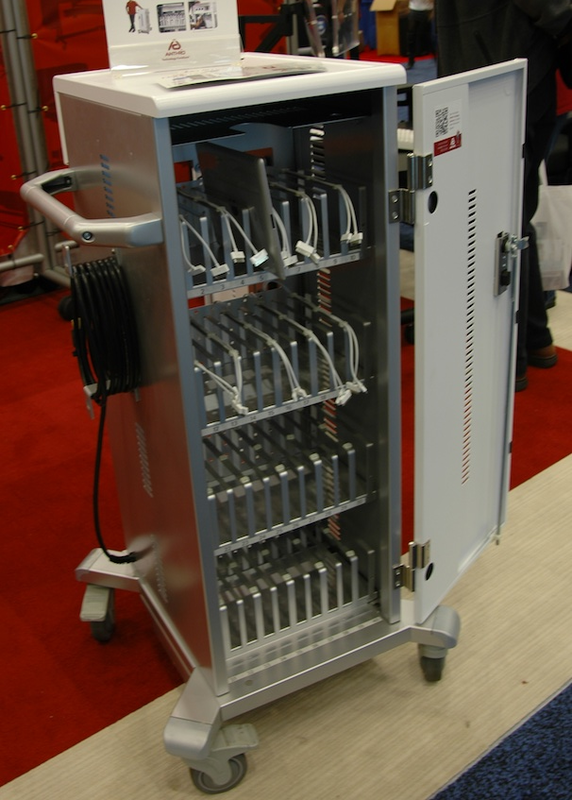 The Anthro Charging Cart & Cabinet for Tablets is a storage cabinet on wheels that can store and recharge up to 40 iPads or Android tablets. This charging cart, on display at Macworld|iWorld in San Francisco has two compartments: one in the front for storing and charging the tablets, and one in the back for cable management and power outlets. Although Anthro promotes the cabinet as one for storing iPads--this is Macworld, after all--the Anthro booth representative tells me that Android tablets will work just fine with it as well, since it just uses the standard power cables that come with your tablet. This particular cabinet costs $1499, but Anthro has other tablet/phone cabinets as well: It sells a cabinet that holds 20 tablets, along with ones that hold 20 or 40 phones. Although these cabinets would be overkill for use in your home, it's easy to see where they might prove to be useful in businesses or schools. Anthro says its storage cabinets and carts are geared toward use in education, health care, and retail. Check out Anthro's site to learn more.